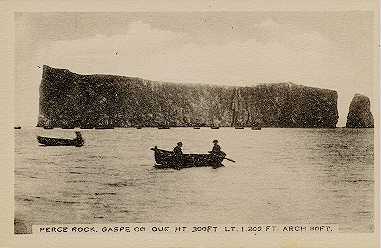 PERCE ROCK - The Gaspe's most famous landmark. My father's family, the COOKES are from New Carlisle on Quebec's Gaspe Coast, hence, the name Gaspe Roots. The Cookes are related to the BEEBE,CALDWELL,CHATTERTON,CHISHOLM,DAY,HALL, SECORD and SHEPPARD families to name a few. My father's mother's family were from Janeville/Stonehaven area east of Bathurst in Gloucester County, New Brunswick which is just across the Baie Chaleur from New Carlisle. These families include BOYD, CRAWFORD, GOOD,KNIGHT,NORTON and SCOTT. My maternal grandfather was from Bishop Auckland, county Durham, England I am studying the GREGG and STRACHAN families there. My wife is of French Canadian and Franco- American background. I am studying the CHATEAUNEUF , MASSE, MOREAU, GOULET(TE) , families of Windsor Mills and Sherbrooke,Quebec as well as Holyoke and Chicopee ,Mass. PLEASE take a moment to sign my guestbook and tell me what you think.Be patient.I have tried different backgrounds and typefaces. How do you like them? Only 1% of my visitors have signed. This is the mill in Bonaventure originally owned by James Day Esq. Master shipbuilder to Charles Robin & Co.
----- Here are some useful links. To get back here just hit your BACK button.